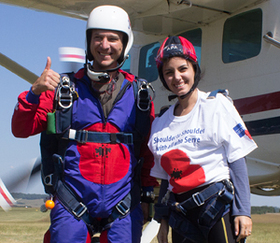 Daring singer Katie Melua recently jumped 13,000 feet for an airborne picnic in support of The Royal British Legion's new summer fundraising campaign Poppy Picnics. Katie performed the daredevil stunt in support of the Legion’s vital work for the Armed Forces and their families. The jump with the Legion’s extreme human flight team, Jump4Heroes, took place at Netheravon, the home of the Army Parachute Association. 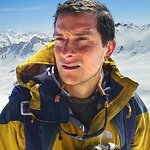 Katie said: "It was an incredible experience. Even though it wasn’t my first ever jump, it’s certainly my first ever picnic in the sky! I still find it really scary before jumping but love overcoming that fear. While Katie, who was joined by her husband, former World Superbike champion James Toseland, opted for the sky-high setting to have her picnic, the Legion is calling on people to hold a Poppy Picnic in any kind of setting to celebrate the invaluable contribution made by our Armed Forces community, and to raise money for the Legion. Whether it’s a games day, a themed event or just an opportunity to show off some serious baking skills, a Poppy Picnic is the perfect way to make any get-together more meaningful this summer. A Poppy Picnic is not only an opportunity to celebrate and honour those who serve; it’s also a chance to show solidarity with Armed Forces families, who hold the fort until their loved ones return home. Charles Byrne, the Legion’s Director of Fundraising said: "Armed Forces families are a key focus for the Legion this year, whether it is employment support, crisis grants or benefits and money advice, we care for people in desperate need. “The fundraising from our new Poppy Picnics campaign is vitally important, and will make a real impact on the lives of those we help.